These Three Simple Recipes for Pork Burrito Bowls are as good as any restaurant Burrito Bowls you might find! And don’t you agree that Pork Burrito Bowls sound like a perfect slow cooker or pressure cooker dinner or Taco Tuesday? Put one of these on your menu for tomorrow night! 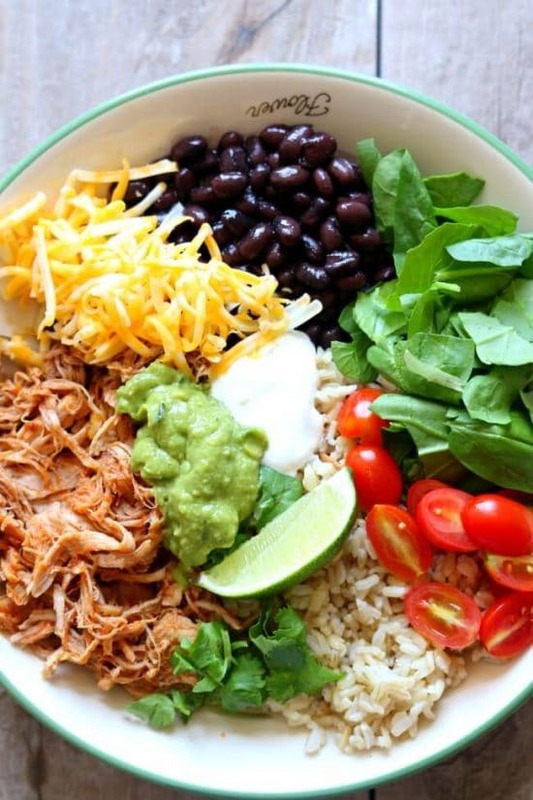 Click here to PIN Three Simple Recipes for Pork Burrito Bowls! Perfectly tender, fall-apart pork cooked quickly in the Instant Pot or slowly in the slow cooker becomes the star ingredient for these Three Simple Recipes for Pork Burrito Bowls. And Pork Burrito Bowls sound so good for an easy dinner that we’re updating this post to include a savory Instant Pot pork burrito bowl and two slow cooker options. 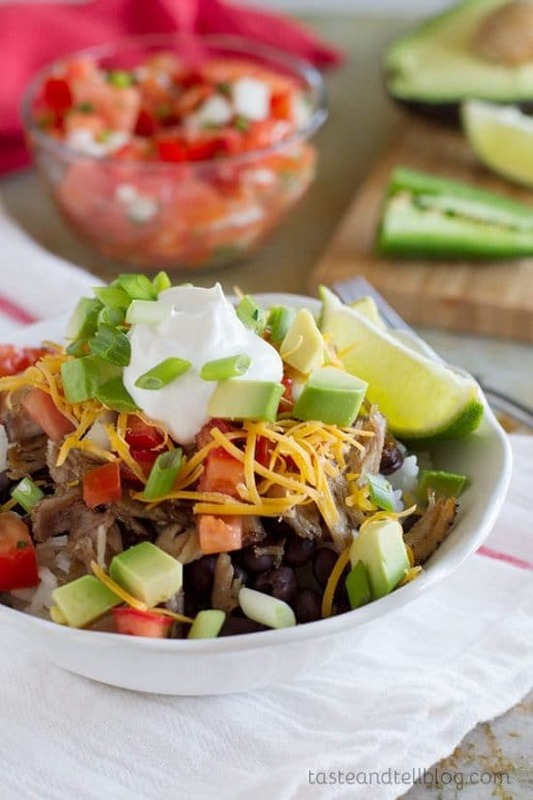 Whether cooked quickly in the Instant Pot or low-and-slow in the slow cooker these pork burrito bowls sound just as good as any burrito bowl you might get at your favorite Mexican restaurant. Serve with brown or white rice, guacamole, black beans, pico and sour cream, or over cauliflower rice for a delicious low-carb bowl. Any way you serve it your family will come back for more! I’m going to let Deborah give the description for her Slow Cooker Pork Burrito Bowls from Taste and Tell: “Caramelized pork carnitas are served over beans and rice, and topped with a fresh pico de gallo.” Browning the pork after it cooks in the slow cooker and using from-scratch pico-de-gallo are two of the things that make this recipe special, and you can also add sour cream and/or cheese if you’d like. Extra tender and shreddable Instant Pot Savory Pork Burrito Bowls from 365 Days of Slow Cooking have just 5 ingredients and cook quickly in your Instant Pot. Add your favorite toppings and enjoy! 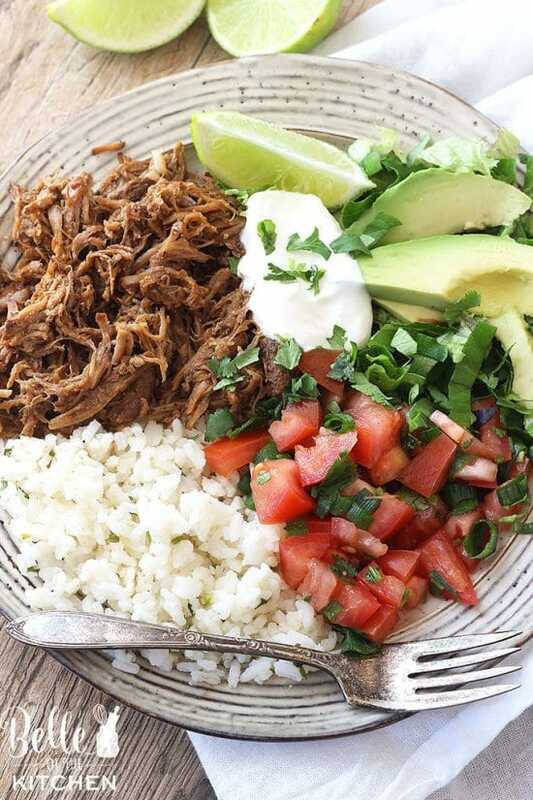 These Chipotle Pork Carnitas Burrito Bowls from Belle of the Kitchen start with tender, juicy pork that cooks all day in your slow cooker. Add some rice and homemade pico de gallo for a delicious family dinner. Love the technique of double-cooking the pork to give it a bit of crispy. I'm going to try that with shredded chicken cooked in the slow cooker.